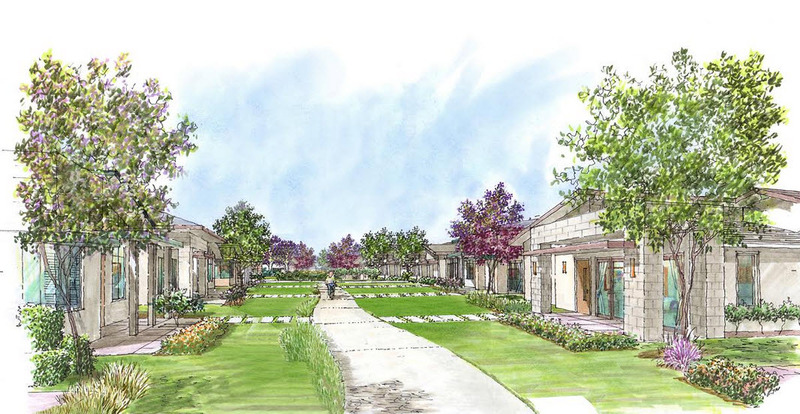 The Davis City Council has approved a sprawling senior housing development project located in West Davis along Covell. Voters will have a chance to approve or reject the project on this year’s November ballot. The project is called the West Davis Active Adult Community (WDAAC). The City has claimed that this discount is based on: 1) the reduced average number of occupants the Developer states will be living in each unit. 2) the promise that most of the costs for services for which fees are assessed are primarily dependent on the number of individuals expected to be living in the units. However, these claims have not been verified by the developer or the City. This claim of reduced residents also ignores the fact that each of the senior single family detached units also has the option to add an additional caretaker unit before or after construction and that all of the senior units can also have minor relatives or unrelated adults living in them under some circumstances. Alternately, one could surmise that because of the design and location of the WDAAC development, most impact fees should be higher than otherwise charged to a normal development in another location closer to city amenities. A. Roadway Fees: Roadway fees are one example. Because seniors living in an isolated development without good access to public transportation will be more likely to use their cars than others, every trip to the grocery store or other errand will require use of a motorized vehicle. Residents from a development immediately adjacent to downtown or a shopping center making a similar trip could otherwise walk or bike foregoing the use of a car. B. Stormwater Fees: The Stormwater fees are also totally independent of the number of occupants of any unit. Stormwater runoff is totally independent of the number of occupants of any unit but is instead is entirely dependent on the lot size which is excessively large for most of this development project. In addition to the fact that the area of the subdivision has historically been susceptible to sheet flooding, much larger fees should be charged to the developer instead of giving him a discount. And yet all stormwater fees for each of the senior units are discounted. This discount in fees might be socially justifiable if only applicable to the low-income housing units if they were run by a non-profit entity, but all of the other for-sale units will be sold at market rates based on then applicable market conditions. The developer is going to sell them at the highest prices he possibly can so a dramatic reduction in development fees simply represents a transfer of money from City budget to the developer’s pockets and will not be reflected in any actual sales price to a senior. This is grossly unfair to the other residents and Davis taxpayers who end up subsidizing the developer’s profits on the project. Mitigation Work: The project proponent is also being given absurdly high credits for doing some of the mitigation work required by the project himself as compared to the City using development fees to hire other contractors to perform the work to mitigate. “1. 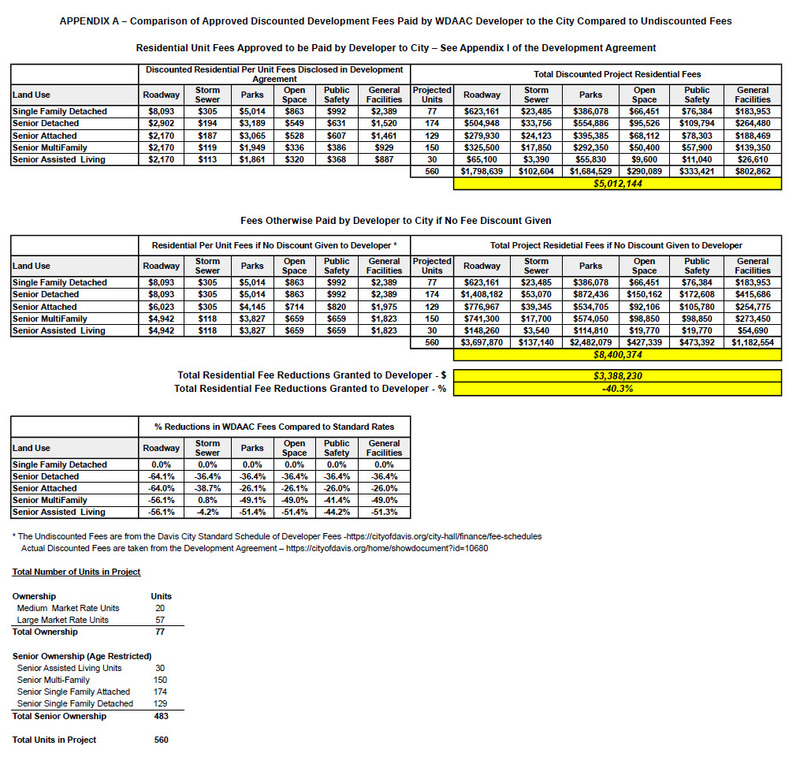 Traffic/Roadway Capital Improvement Program Fees. This $1.8 million credit given to the developer was after the normal fees were already discounted more than 50% from the otherwise normal roadway impact fees of almost $3.8 million that should have been charged. This decision creates a very bad planning precedent for future developments. “Parks” Impact Fees: Another example of an egregious give-away of City funds to the developer are the “Parks” impact fees normally charged to all new developments. Normally a development project of this size would require a separate neighborhood park to be put in because the City’s General Plan specifies that residents should be within 3/8 of a mile of a neighborhood park. Based on the project size of almost 75 acres, this project would normally require that a park of 5 acres or more be installed in the development. Yet the WDAAC developer is only going to be installing 5 small pockets of land totaling less than 2 acres, scattered throughout the development, with no further justification of this exception given. So, combined with the reduction of normal “Parks” impact fees from about $2.5 million to $1.7 million on the basis of the units having less occupancy because they are senior occupied (though some additional occupants may be permitted), these additional waivers are used to lower the total “Parks” impact fees to only $250,000! These reductions in impact fees are not fair or equitable and represent egregious violations of the public trust. This is an abusive developer give-away and functionally amounts to the subsidization of developer profits by Davis taxpayers. This unfortunately sets a very bad precedent for all future developments in Davis. The authors will shortly publish Part 2 of this article in which they disclose how the City projects a positive annual return to City coffers as a result of build-out of this project. However, this estimate is based on accounting methods that assume unsubstantiated reduced costs on a per resident basis for providing basic City services such as Public Safety and Transportation. That article will also discuss the fact that there are almost no guarantees that this project will ever be built as proposed because the Baseline Features are vague and imprecise and the Development Agreement is exceedingly weak. It is funny that the Alan and Pam don’t understand how an “Activity and Wellness Center” will probably provide MORE “recreational benefits” to the seniors than something with a couple slides like the new ~$1mm Rainbow City Park. I don’t care either way about this project. But, what I’ve noticed is that people opposed to projects never argue the simple line: too big, too much, we don’t need it. It’s always this kind of stuff. I don’t know about others, but I just start tuning it out. The question before us: do we need the project? If we do, vote for it. If we don’t, vote against it. End of story. I’ve noticed is that people opposed to projects never argue the simple line: too big, too much, we don’t need it….The question before us: do we need the project? Your criteria for evaluating whether a project is deserving of our vote is not the only criteria used by other people. For instance, another person may decide we do need this project but only if we do not grant taxpayer subsidies to the developer. Both criteria (along with many others) are valid and deserving of a quantitative response from those opposed to or supportive of any project. But I can only make so many arguments or address so many deficiencies of this project in a single article. I chose to start with addressing the massive developer give-aways in this first article. I will have lots more to say about whether this project really meets the City’s housing needs in future articles. Stay tuned. Also your assumptions here aren’t necessarily accurate: “every trip to the grocery store“ – they can walk to Safeway from the location or use a motorized chair. Your conclusions are questionable at best without a deep dive into the analysis and after reading the inaccurate statements you made on affordable housing last week, I won’t give you the benefit of the doubt here without an independent analysis that shows you are accurate. The above comment is brought to you by the vacuum of space, which has a similar amount of useful content. Your conclusions are questionable at best without a deep dive into the analysis and after reading the inaccurate statements you made on affordable housing last week, I won’t give you the benefit of the doubt here without an independent analysis that shows you are accurate. So I have given you the links in the article so see what the developer is paying in development fees and what normal development fees are charged by the City. You’re a bright fellow and it really doesn’t take to much effort on your part to click though to those links to see if the numbers I used are correct or not. So to hide behind a skirt by saying you do not believe me unless there is an “independent analysis” is somewhat disingenuous on your part. If you have specific allegation to make about the accuracy of my statements in this article, then feel free to do so but please back it up with facts rather than just your opinion. Your hip shots to the contrary, I also stand by my statements last week that there is “no guarantee” that the affordable housing will ever be built. Even David Greenwald conceded that point blank. The controversy was whether or not the developer really had enough skin in the game by just donating 4.25 acres of land and not putting anything toward the non-infrastructure actual apartment construction costs like every other major developer in the City has been made to do for the past 10 years! To explain it again in very straightforward terms: Every major developer from Cannery to Lincoln 40 to Nishi has agreed to not only provide the land or space for the low income housing and put in the infrastructure but also actually build or contractually guarantee that the low income housing associated with their projects will be built. The only exception was Sterling where they agreed to donate the land PLUS contribute more that $55,000 per apartment toward the actual building construction costs. Why were similar costs or requirements or guarantees not imposed on the WDAAC developer. Well, David Greenwald’s response was that it was because the land was worth $4,000,000 and that was enough. But my question then and now is the same – who says it is worth $4,000,000? David Greenwald says that is what he was told by “knowlegdeable” people in the real estate industry. OK, but who actually said that? The developer? The recipient of the donated land, Neighborhood Partners? C’mon folks, if you are going to rely on that statement to rebut the facts I otherwise presented, at least provide some documentation to substantiate that claim of land value? Is there a formal appraisal of the property or at least a statement of comparable values of similar properties? What is the value that Taormino will be paying for the property? Anything, please, …other than just pulling a number out of thin air and saying that is what you were told! And so what if the value really is $4,000,000? I repeat my statement that every other major development in Davis has either donated the land AND actually built the low income housing OR donated the land and put up more that $55,000 per apartment to actually build the units. Why should Taormino get any better deal from the City than anyone else here. He shouldn’t. And the fact that he is being given that sweetheart deal is another glaring example of what a terrible deal the City negotiated on this project – not only for the taxpayers in terms of Development fee reductions I documented in the above article but also for the low-income seniors who might otherwise occupy this low income housing if it is ever built. And let’s face it, if Taormino was forced to donate the land AND put up the same $55,000 per unit in construction costs as Sterling, that would be millions and millions of dollars less the non-profit would have to raise to get the units built and the liklihood of it actually ever getting built is that much greater. not putting anything toward the non-infrastructure actual apartment construction costs like every other major developer in the City has been made to do for the past 10 years! For nearly 30 years, almost all of the developments that gave land to completely meet their affordable requirements did not also need to provide additional funding. WDAAC is following that nearly 30 year history but is in this case providing additional land for there to be almost three times the affordable units required (land for 150 units provided where only land for 56 units would be required). Over 20 affordable housing projects have been built on land provided by developers where the land but no other funds were provided. So, assuming these statements are not contradicting each other, ‘for the past ten years’ seems to be an important part of your argument. Because it hasn’t always been the case. Yes, I concede that in developments older 10 years that land donation alone may have sufficed to meet the developers low income requirements. However, just as I have detailed the the approved major developments and their low income contributions in the last 10 years (Cannery, Lincoln40, Sterling, and Nishi), it would similarly be useful if some of the more recent developments referred to by David Thompson could be identified and their contributions to low-income housing disclosed. Obviously, it is unrealistic to ask that all 20 projects over 30 years that he referred to be researched and disclosed but maybe just the ones from 10 years ago to 15 years ago – or the most recent 4-5 projects in that same time frame. I also note that the low-income housing requirement used to be that 35% of units had to be set aside for low income housing which number dropped substantially to 15% in recent years. So it would be interesting to see how the land donated compared to the developed land also changed in that regard. I do not see any links? Why would that be illuminating? If they have a lower requirement, we would expect the amount of land donated to be correspondingly lower, or are you attempting to hold the developer accountable for not meeting a requirement that they aren’t required to meet? Hmmm . . . my vacuum comment is in the wrong place, referring to the wrong post. If I gave a damn, I’d . . . . . . . . . . .
You are advocating that we adopt or don’t adopt a project without considering it’s pros and cons? Because you “tune out” you think that need alone should determine development without any consideration of the relative benefits and detriments? No consideration of possible harm incurred? I must have missed that point. The point I was making is that we should evaluate the pros and cons of the project and where Alan immediately takes us down is so esoteric exercise where we have to evaluate whether the city is extracting a fair amount for the project. I’m sorry, but I don’t have that kind of time to evaluate the accuracy of Alan’s claims. So I think most voters should approach the question much more simply – do we need this project and does it provide us with what we need. With the exception of the completely undefined “Transit Hub,” . . .
That’s a curbside bus stop with no bench. It will be a passenger railroad station once the Central Pacific builds out west (West Davis that is) from Promontory Point.